In the (many) years I have covered the NHL, I never ceased to be amazed at the absolute relative lack of respect the league shows its coaches. It bugs me so much, I even used the “r” word, the lamest expression and most cliched response in professional sports. So Barry Trotz coaches the Washington Capitals to the Stanley Cup, yet the contactual reward he earns is a 20-percent raise from his expiring deal, to $1.8 million, one of the lowest salaries in the league … leading him to resign, realizing he can do better than that. 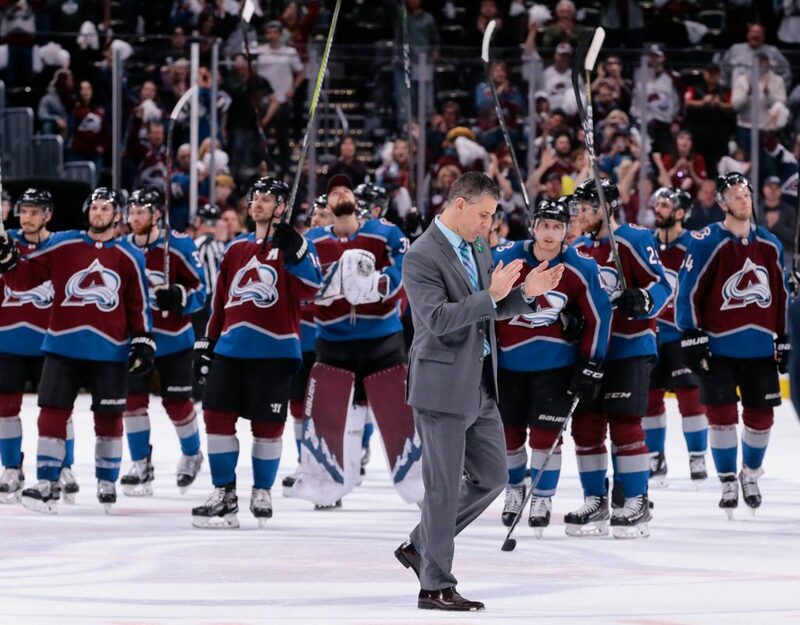 On Wednesday night in Las Vegas, at the NHL Awards at the Hard Rock Hotel and Casino, Avalanche coach Jared Bednar — whom I profiled here — will be among the three finaiists for the Jack Adams Award as the league’s coach of the year. The others are Gerard Gallant of the Vegas Golden Knights and Bruce Cassidy of the Boston Bruins. Often overlooked about the Adams Award is that scribes don’t vote on it. I don’t think that’s a major distinction here, since I believe that NHL writers — after performing their impactful, potentially APSE-award winning duties by being the first to tweet the lines from the morning skate — would agree with the broadcasters. To award often becomes — and I don’t have a problem with this — the way to honor coaches who prodded their teams to overachievement. The unfortunate part of that is that it underplays the fact that it’s also hard to get the most out of good teams. In this case, Gallant is the choice so obvious, any other vote — if there are any — would be a reach and perhaps a contrarian attempt to prevent the expansion team’s coach from being a unanimous choice. That said, the job Bednar did was remarkable, and some of it dates back to the final days of the Avalanche’s historically awful 2016-17 season. I kept waiting for him, the first-year NHL coach, to crack, to succumb to the realization that his dream had turned into a nightmare. By the time training camp rolled around again last September, he already had established himself as a credible voice, as more than Patrick Roy’s successor, as more than a journeyman ECHL and AHL coach and player trying to have more than a brief tenure coaching in the NHL. He prodded Nathan MacKinnon, a Hart Trophy finalist, to greatness. He validated Joe Sakic’s decision to retain him and avoid making him the scapegoat for a terrible season that, frankly, made Sakic look bad and raise questions about his suitability for his role at the top of the hockey operation. If Sakic had been embarrassed or insecure enough to need someone to blame, and part of that is the wider safety net his iconic status gave him, Bednar would have been gone after one year. Any other year, the job Bednar did behind the bench and elsewhere — going from 48 to 95 points — would have merited the Adams Award. Then again, Barry Trotz isn’t even a finalist. Terry Frei of the Greeley Tribune writes two commentaries a week for Mile High Sports. He has been named a state’s sports writer of the year seven times, four times in Colorado and three times in Oregon. He’s the author of seven books, including “Third Down and a War to Go” and “’77: Denver, the Broncos, and a Coming of Age.” His web site is terryfrei.com. His Mile High Sports commentary archive and additional “On the Colorado Scene” commentaries are here. His major Greeley Tribune pieces, including the latest on Shoes Without Borders, can be accessed here.